Question: What do you get when you gather 110 students interested in science and allow them to think creatively, problem solve, experiment and collaborate? Answer: Learning at its best! 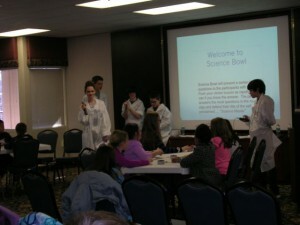 The 2nd Annual WCS Elementary Science Olympiad was a huge success! Throughout the day, students participated in a variety of events that challenged their thinking. The Zoo School facilitated a Wildlife Safari event where students practiced their observation and inference skills. The Barge Building event challenged students to create a foil structure that would float in water and support the most pennies. Mystery Powders had students identifying substances based on their reactions to different liquids. Other events included Rock Hound, Straw Tower, Mystery Boxes and Edible Vehicle. It was a great day thanks to the organization of Sheree Person-Pandil and John Thomsen from ESU #3. We also had 9 amazing WHS students who shared their love of science by helping out at each event and facilitating a Science Bowl. It’s so great to offer these types of opportunities to our students. Seeing the level of engagement and enthusiasm from the students is what makes our job so rewarding! Thank you to everyone involved in making this day a success! Click on the link below to watch a short iMovie trailer of the day. The Science Olympiad was a blast!!! The folks at ESU 3 are glad you asked. We look forward to future events. John T.
I really had fun! It meant a lot to me to learn more about physics and how things float, lift, and other things like that without breaking the object. I also had a lot of fun with the powder mixtures, knowing that you did not do that activity, you had different powders and different fluids and you would test them to see what it would do. I agree the science Olympiad was a fun time. After it, I thought that I wanted to become a geologist.